Miles writes a blog for the association called Speaking of Precision. Miles sheds some current insights into the issue. Enjoy! I remember the excitement of back to school when I was child – new clothes, new shoes, maybe a new notebook, and new school supplies. These items embodied my parents’ wishes for us to succeed academically and earn a better place in the world. Blue-collar budgets meant money was tight, and a well thought out list assured that they did the best for the family with the resources we had. It is back to school time and while my children have long since left the nest, I have been thinking about what we, would as employers, put on this year’s back to school list for our shops and for our industry? People that want to work. At a meeting in Chicago recently, I met a VP of Operations from a major soft drink company. What is number one on his list? He told me ‘people that want to work.’ Really. ‘I am looking for people looking for a job, not those just looking for a paycheck. I’m looking for solid people who can make a difference as they make a career.’ His company offers internships and a company development program, but his first task every week is to review his vacancies report. Add people who want to work to the list. Looking for talent, not labor. U.S Productivity is high, and one consequence is that we need talented people, not just bodies in the ‘labor gang.’ U.S. productivity doubled from 2008 to 2009; then it doubled again in 2010 according to the Organization for Economic Cooperation and Development. The jobs that were cut in 2008 and 2009 tended to be the least skilled positions at any company, according to most press reports. Now, companies seem to have hit the limit for what they can produce with the talent that they have. To make more sales, they need to add talent, not just bodies. Add talented people to the list. Urgent need for craft workers. Much of the value add in our industry comes from the programming, set-up and operation of high-tech multiple axis CNC machines. This is not ‘just push the big green button’ work. An inefficient program can cost the company dollars per part if the program runs too slow. Setting up the machine in a longer time than that planned results in higher costs and lost profits. Operators have to be on top of their game to assure all features are produced to spec and that tools are replaced before they create problems. The craftsmen (and women!) in our precision machining industry add value by what they know and how they do. Our industry’s employees are getting closer to retirement. Median age (half the workforce is older, half is younger) was reported to be 51 for occupations in our industry according to BLS. 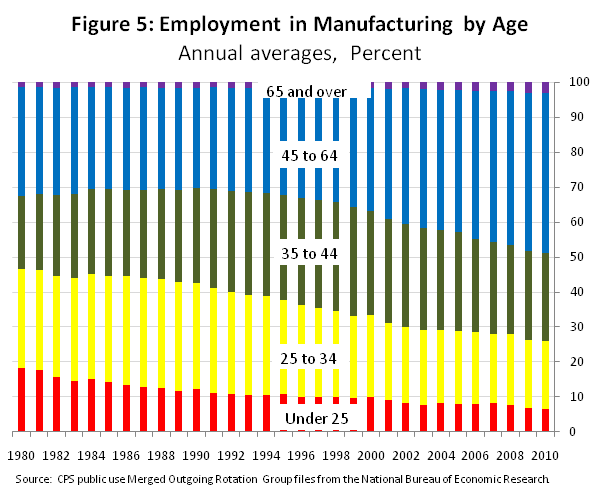 According to Mark Doms, Chief Economist for the U.S. Department of Commerce, there is a “…longer-term trend of an increase in the average age of those employed in the manufacturing industry. Those age 45 years or older now comprise almost half of manufacturing employment, up from about one-third in the mid-to-late 1990s.” With 10,000 baby boomers turning age 65 each day, our industry – every industry – needs a plan to retain the knowledge and capture the skills of our departing workers. Willing to train. My parents bought me my school supplies, knowing that I would take them to school. Given the need to replace our retiring highly productive craft workers, what has changed is that for employers at least, we are going to have to step up our investment in training, cross training, and setting up programs for knowledge retention and the capturing of ‘tribal knowledge.’ Unlike my parents, who bought me school supplies, packed my lunch, and sent me off to school, employers today need to take charge of the training and development of the people who add value in our shops. We can no longer take for granted that a surplus of craft machinists is ‘out there’ somewhere just waiting for our offer. We need to actively manage for today’s reality – High productivity, high technology workplaces require skilled, talented, trained employees. We can’t just take what the schools give us. We need to tell the schools what we are looking for in our hires. Eliminate the skills gap. The policy wonks in Washington D.C., many state capitals, and on our TV ‘news programs’ can debate the finer points of whether or not the U.S. has a skills gap or a skills mismatch. Every employer that I have spoken with in the precision machining industry has told me that if they didn’t have an opening, they would create one for the right candidate if they applied at their shop. That fact alone tells me that the debate is irrelevant. U.S. advanced manufacturing companies must have a talented, trained cadre of capable workers in our industry specialties like CNC programming, Setup, and operation, if we are to remain competitive and sustain manufacturing as a competitive strength here in North America. Like my folks who wanted to see their kids earn a better place in the world, our companies should be leaders in helping to improve the visibility, value and prestige of the advanced manufacturing people who make a difference in our shops each and every day. By applying their talent, skills and efforts, cars are safer, food and beverages are delivered hygienically, and aircraft and medical devices can be relied upon. As employers, we have a list of what we need. Our job now is to turn that list into a list of actions to make a difference. The first item on that list should be “to increase the visibility, value and prestige of precision machinists, programmers, engineers and our other high value team members.” If we take this first step, we will make it possible to find people who want to work, people with talent, people able to be trained for our craft, so that we can eliminate the skills gap and keep our shops as competitive and sustainable centers of advanced manufacturing and productive value adding activity. The longest journey starts with but a single step. 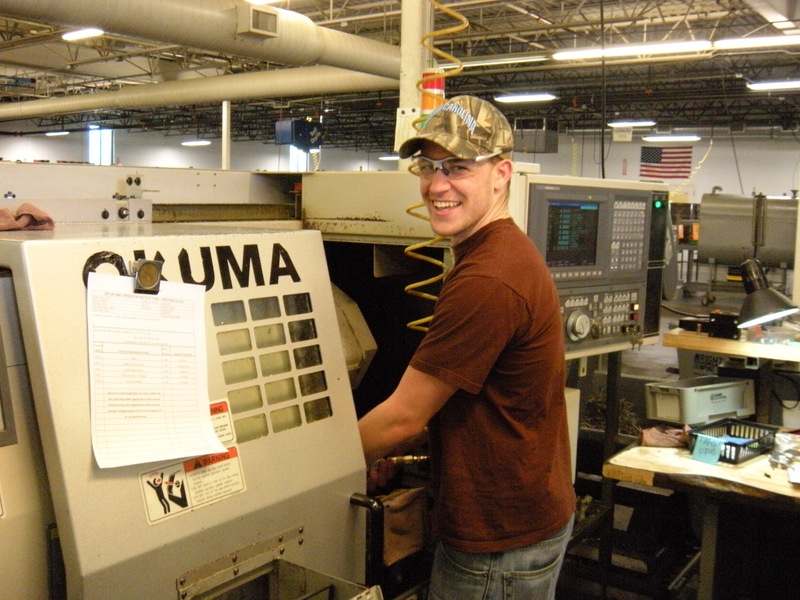 Let’s take that first step to let the world know just how good a career awaits them in precision machining. We can, we must, sustain the competitiveness of our shops and industry through our back to school investment.